Read the article below NYU’s Madeline Friedman wrote about our efforts to combat Ebola. In early November of 2014, members of the NYU community came together to see if their creative thinking could help “hack” the Ebola outbreak and provide government leaders and health professionals with new solutions for containing the disease’s spread. This hackathon was organized by The Greenhouse and the Design Tinkering Club at NYU Polytechnic School of Engineering in response to the challenge issued by USAID in conjunction with the open innovation platform OpenIDEO. The 45 people who participated on six teams at the hackathon included “student programmers, data scientists, medical experts, and industrial designers,” said Rishi Jasapara, a Design Tinkering Club member and event organizer. 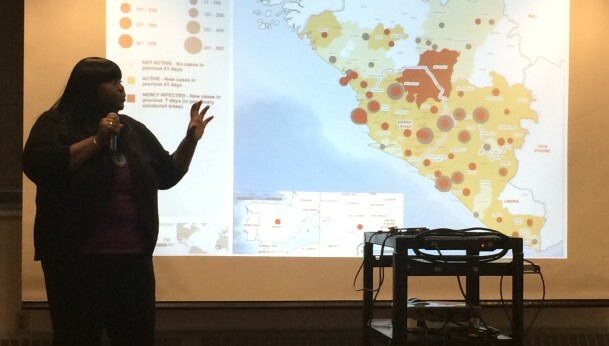 Top projects from the hackathon were shared on OpenIDEO, and include an Ebola hotline with automated messages on prevention, care, and burial, and an Ebola data visualization project that maps patterns to identify and direct resources to hot spots. One project, Jasapara added, actually had no members with tech backgrounds but still came up with an innovative solution. The CHANCE II Bucket can be used by Ebola patients until they can make it to a medical facility. The bucket has three compartments—cleaning, prevention, and treatment—and each compartment contains visual instructions on how to use the kit until medical care is available. Another project, SMSanté, also had members who don’t strictly work in technology. Pamela Wu is a Ph.D. student at The NYU Sackler Institute who works at the Center for Health Informatics and Bioinformatics (CHIBI). Her project partner, Arnav Sood, is a first year student at the College of Arts and Sciences, pursuing a joint major in Economics and Mathematics. SMSanté allows people traveling or officials trying to map the epidemic to find out via text message in French whether Ebola has been confirmed, and the proximity of the most recent case. The creators of SMSanté will be partnering with Camara’s foundation to put the project to work in Guinea, and have already received a prototyping grant from the Greenhouse. The next step, Wu said, “is to make our prototype scalable with permanent databases and hosting on a dedicated server account so that it doesn’t stop functioning when I shut down my laptop.” They are also in the process of applying for an USAID deployment grant, Sood added. Hack Ebola @NYU is one of many different social innovation initiatives that members of the NYU community are organizing across the University.